Every driving instructor in the UK must undergo periodic tests of continued ability to give instruction, (Check Tests), in order to examine their teaching ability and to remove sub-standard instructors from the register. These Check Tests are carried out by the Driving Standards Agency using highly trained senior Examiners. The examiner sits in on an actual lesson and grades the instructor on a scale running between 1 to 6, dependent on their teaching ability. To remain on the Driving Instructor Register instructors must achieve a BASIC MINIMUM STANDARD OF GRADE 4. If they grade lower than 4 three times consecutively then they are removed from the register. The grading scale is listed below. GRADE 1 - 3 is sub-standard. GRADE 4 is adequate, with several deficiences in instructional technique. GRADE 5 is good with some minor weaknesses. 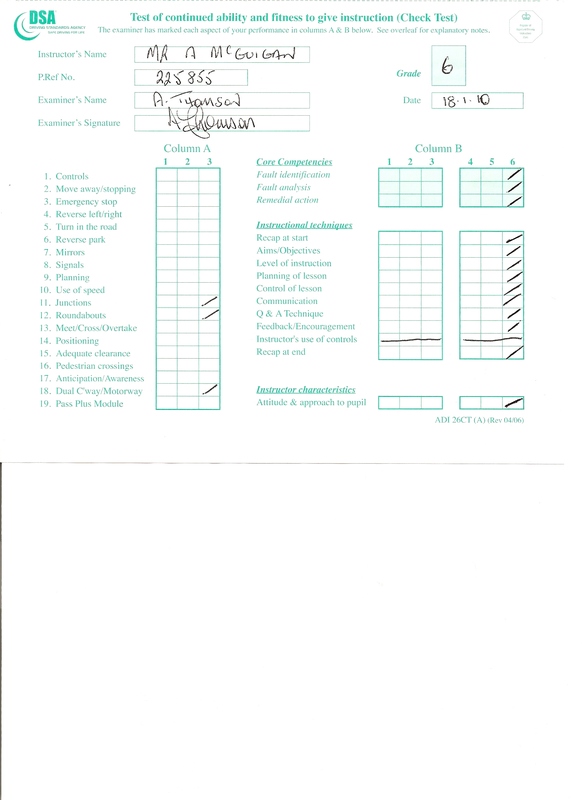 GRADE 6 is very good, the highest standard with no significant weaknesses. The DSA grading system is the ONLY official indicator of a driving instructor's ability, you may see instructors advertised as five star, professional, fully qualified etc etc, however, according to the DSA's own figures the majority of instructors in the UK are graded at the BASIC MINIMUM STANDARD of grade 4. I have included a copy of my last FLEET TRAINER Check Test Grading sheet below, the marks in column B run on a sliding scale, ranging from dangerous instruction at grade 1 to excellent instruction at grade 6. The FLEET Check Test involves a training session with a fully qualified driver and is of a much more advanced nature than the ordinary learner driver Check Test which the 90% of instructors who are not FLEET qualified sit.